A Program for the complete management of the navigation workstations of Internet Cafés Windows and Linux, Hotspot, Call Shop, Cyber Cafés, Hotels, Lottery Agencies, Libraries and Betting Agencies. 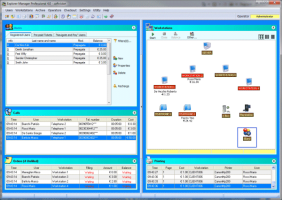 Softvision Explorer software can completely manage Internet Cafés, HotSpots and Call Shop. The process is composed of four modules: Explorer Manager, Explorer Client, Explorer Printer Monitor and Explorer Coins. 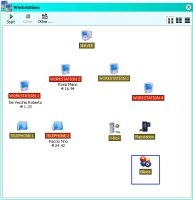 TThe manager and the server are installed on a server workstation (main) while Explorer Client (only for Cyber Café usage) must be installed on navigation workstations. The module Explorer Printer Monitor is used to detect the print-outs made by the user and should be installed on computers connected to USB printers only if they do not already execute Explorer Manager or Explorer Client. Lastly the module Explorer Coins allows you to create a recharge workstation using an electronic coin acceptor. Remember that if being used as a Hotspot or Call Shop, the only module to install is Explorer Manager. Thanks to this program the premises provider can register customers, define the means of access to PC and telephone workstations (restrictions, permitted programs etc.) and monitor their use. The navigation workstations can only be used to navigate and run certain programs defined by the administrator. Any other operation (executing programs, navigating unauthorised sites etc.) will be blocked while Explorer Client (which can only be closed by the administrator using a password) is running. When used as a Hotspot, customers can connect to the internet only by using their browser and without the need for installation on their computers. Management of Hotspot for client WI-FI access without using Explorer Client . Navigation mode : pre-paid, post-paid, by time, traffic, subscription or free. Management of workstations : three different display modes (table, frame or icon), manual start-up, session transfer, volume control, remote control, screen-shot request, workstation under maintenance, remote task manager, automatic restart and closure and session closure. Management of permitted applications : possibility of mounting an ISO image before executing the application, parameters, execution of a program and start-up and ending of a session, work directory and automatic search on permitted application workstations. Centralised management of software licences to save on licence purchases. Workstation start-up with Wake On Lan. 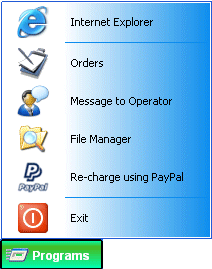 Management of automatic recharges using Paypal or Credit Card . Firewall on ports, URL, IP and keywords . Band limitation for uploads and downloads . Information on the user with notification of notes present, documents missing or disabled users. Complete integration with Internet Explorer. Organization of users in groups, with the possibility of setting various permissions or permitted applications for group members. Enabling of drives per type (floppy, internal hard disks, removable disks, etc.). You can create a virtual user drive which users can use to save their data and even store them. Users can navigate on a limited number of sites with external links disabled. Monitor the real time workstations are used. Monitor printing to automatically debit the cost of printing by customers. Management of orders from workstations with the possibility of creating price lists, organised by category and products on sale. Archive analysis : use of workstations, recharges made by a customer, credit used, printing etc.. with exporting of results in Excel, in Html and in text format. Internal messaging system to enable customer dialogue with the administrator. Utility to analyze and format Smart Cards. File manager on workstations to enable the user to copy or move downloaded files from his/her user drive to other supports (pen drive etc.). Files and User Registry Keys. Mac Address White List : you can specify the Mac Addresses that can navigate the hotspot without authentication. Multiple servers : sharing of users among different sites. Notifications of customizable events : post-paid log-out sessions, customer login with notes etc. Hotels and Libraries: the package is very useful, in Hotspot mode, for allowing customers to navigate or use common software (management, word processing or office) all in complete safety. Call Shop : thanks to VoIP support, Softvision Explorer allows you to open a Call Shop with a minimum initial investment and avail of telephone rates that are extremely competitive. Authentication : This section is used to specify if the customer must login with a username or password or if he can use a Smart Card. In the first case, it is necessary to set the Username and Password fields while, in the second, just click "Create Smart Card" to create the user's personal Smart Card. Not enabled : grey is associated to this status. A workstation that is not enabled cannot execute the Explorer Client navigation program. Naturally, only PC type workstations can have this status. Free : the workstation is not busy and can accept connections. Green is associated to this status. Explorer Client not executed : the navigation workstation (PC type) is enabled, however the Explorer Client program is not running. Olive green is used. Busy : a user is using the workstation, which appears in red. Under maintenance : a workstation with this status, identified in yellow, is blocked and no user can access it. This section of the main window displays the names of customers in the archive together with their balance due and navigation method (prepaid, post-paid, time base etc..). 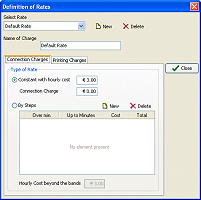 If the customer has a negative balance, the figures in the Balance Due column are red. This normally happens when customers are navigating in post-paid mode. Softvision Explorer monitors the customer's printing and automatically debits the cost to his prepaid or post-paid account. The Rate Plans are entirely similar to those that phone companies use to decide what rates to charge the customer when he makes a phone call. Softvision Explorer uses them to determine the rate the customer will be charged when he accesses a workstation. The program ExplorerClient.exe is the module that allows the customer's controlled access to the workstation. Once launched, the program takes control of the machine and prevents the user from doing anything that could damage the Windows configuration (deleting system files, accessing the hard disk, task manager, etc.). 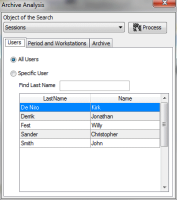 When using Softvision Explorer each user must belong to a Group. The user is assigned to a Group in his user record. 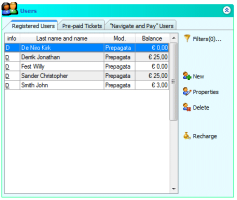 The user group defines what functions the client can access when he connects. In this way, for example, it is possible to define which programs the users in a certain group can run or which disks they are allowed, or denied, access to. By defining several groups of users it is possible, for example, to group your clientele based on the level of trust you grant them. This function analyses the archive to derive a wide range of information about the data in the archive. Navigation sessions: analyses all the customer's navigation sessions. The beginning and ending date, the workstation used, the sites consulted and the cost are shown for each session. 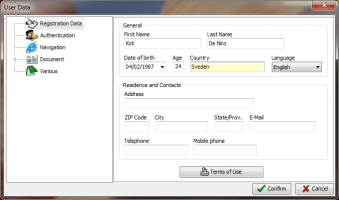 The data displayed can be easily exported in Excel, HTML or text format. Recharges, Printing, etc. : in this case, a complete list of all the printouts and recharges for each user, the credit used during the session and the duration of the session.